Class structures explained (H) is hands on, there will be lecture moments, but you should expect to get your hands dirty! (L) these courses are mostly lecture with a minimal amount of hands on work. (W) workshops are longer in duration - students will leave the class with completed or nearly completed work. Students learn the basic techniques for making a coiled basket. Information on choice of materials is discussed, with some historical background of the art. Each student will leave the class with a small completed oval basket (approximately 4" w by 5" l by 2" h.) All materials are provided. Cost for this 5 hour workshop (two 2.5 hour sessions) is $40.00. Students build upon the basic techniques with circle starts, openwork construction, and a variety of fibers. Discussion of form and function, and impact various stitches and fibers have on these. Each student will leave the class with a nearly completed basket (approximately 4" w by 6" l by 3" h.) Basic materials are provided. Feel free to bring fibers you would like to incorporate (call beforehand with questions.) Additional core materials will be available for purchase, if you prefer to create a larger basket. Cost for this 2 session (6 hours total) workshop is $45.00. Make a pair of slippers, or boots out of felt. Learn to make a template sized to your feet, do the preliminary shaping on the table, finish your footwear on your own feet, or on a set of shoe lasts you can cusotom build for your feet. 10 a.m. - ~4 p.m.
Two Dyes, Pomegranate for a range from yellow to orange, and Logwood for shades of purple. 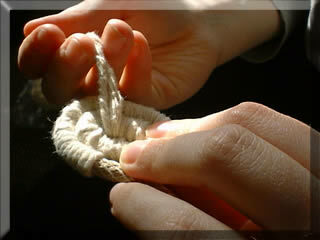 Class will cover preparing yarn or fibre, mordanting, and use of an afterbath. This class is held in the detached dye kitchen. Dress in layers; the temperature is variable with the weather and number of dye pots on the burners. 10 a.m. - ~5 p.m. This short (2 hour) lecture introduces student to the amazing possibilities of polymer clay. A slide show featuring the works of many members of the National Polymer Clay Guild, as well as an assortment of Susan's works, will be shown. Students will have the opportunity to mix and/or marble some clay and shape some beads or buttons for baking at home. All materials provided by the instructor. This class will include an overview of the various clays available. Cost is $15.00. Learn to make the three basic canes which are the basis for almost all complex canes. Proper conditioning and basic reduction techniques will be covered, as well as storage options for raw and cured clay. All materials provided by the instructor. Cost for this 4 hour hands-on training session is $30.00. Susan covers the necessary steps for making two intricate advanced canes for use as buttons, jewelry, beads, etc.